Synonyms: Eugenia involucrata, Phyllocalyx involucratus, Phyllocallyx laevigatus. Rio Grande cherry is a native of Brazil. 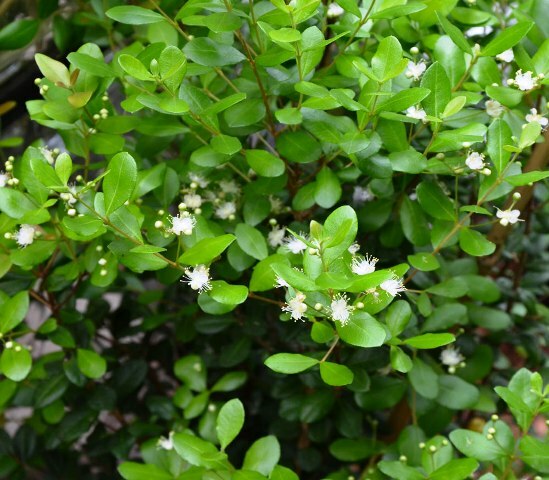 It is a small evergreen tree or large shrub which commonly grows to about 15 feet. However, it may grow as high as 30 feet under favorable conditions. It has an upright, compact habit of growth and is very attractive, especially when in bloom. The smooth, glossy, dark green leaves are narrow elliptic, 2½ to 3 inches long and are borne on short, grooved petioles. The white flowers are solitary and are borne in the axils of opposite bracts from March to May. The fruit is oblong to obovate, ¾ to 1 inch long, with a persistent calyx at the apex. The skin is thin and dark red or purple in color. The juicy flesh has a good, subacid flavor. 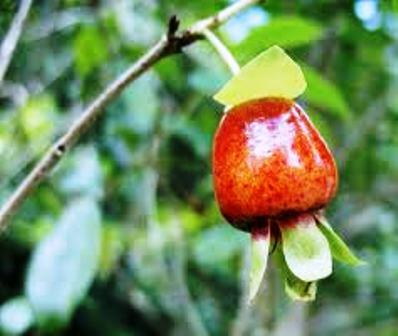 It contains none or 1 to 2 white, rounded seeds, about ¼ inch in diameter. The fruit matures in April to June, about 3 weeks after the flowers open. Fruiting may occur in the third year after planting under favorable conditions but it often takes longer. The fruits are eaten fresh. These are also processed into a jelly which is greatly appreciated.